Sorry, this product is no longer available, replaced with the BR1000MS. The Back-UPS Pro family offers guaranteed power protection for high performance computer systems, routers/modems, external storage devices, game consoles and other electronics in your home or business. Models supply abundant battery backup during outages and stabilize unsafe voltage levels. They provide protection from damaging surges and spikes, and allow the use of management software so you get the most out of your unit. Premium features of this family include Automatic Voltage Regulation (AVR), an LCD display, and energy saving functions that reduce electricity use. Together with the rest of the Back-UPS Pro's standard features, they are the perfect choice to protect your data and keep your system available. Green mode - Patent-pending operating mode that bypasses unused electrical components in good power conditions to achieve very high operating efficiency without sacrificing any protection. Power-saving outlets - Automatically cuts power to idle equipment to conserve electricity. Resettable circuit breaker - Easy recovery from overloads; no need to replace a fuse. Cold-start capable - Provides temporary battery power when the utility power is out. Serial Connectivity - Use any Home Automation network to monitor and control the S20 through its RS-232 serial port. For information on how to communicate with the S20, see APC's Application Note #102. Crestron and AMX installers should visit their respective websites for information on how to integrate the S20 into those networks. Disconnected battery notification - Warns when a battery is not available to provide backup power. Dataline Surge Protection - Provides protection of connected equipment from power surges on the data lines. Automatic self-test - Periodic battery self-test ensures early detection of a battery that needs to be replaced. Adjustable voltage-transfer points - Maximizes useful battery life by widening the input voltage window or tightening the output voltage regulation. Adjustable voltage sensitivity - Provides the ability to adapt the UPS for optimal performance in specific power environments or generator applications. Audible alarms - Provides notification of changing utility power and UPS conditions. USB connectivity - Provides management of the UPS via a USB port (not available on all models). Serial Connectivity - Provides management of the UPS via a serial port. Transformer-block spaced outlets - Protect equipment with input transformer blocks without blocking access to other receptacles. Boost and Trim Automatic Voltage Regulation (AVR) - Gives higher application availability by correcting low and high voltage conditions without using the battery. Intelligent battery management - Maximizes battery performance, life, and reliability through intelligent, precision charging. Safety-agency approved - Ensures the product has been tested and approved to work safely with the connected service provider equipment and within the specified environment. Lifetime data recovery warranty - Provides peace of mind by providing professional data recovery services in the event data is lost due to the failure of the unit. Building Wiring Fault Indicator - This LED informs users of potentially dangerous wiring problems in the wall circuit. Adjustable voltage sensitivity - Provides the ability to adapt the Power Conditioner for optimal performance in specific power environments or generator applications. Battery replacement without tools - Allows quick, easy battery replacement. LCD graphics display - Text and mimic diagrams that display modes of operation, system parameters and alarms. Boost and Trim Automatic Voltage Regulation (AVR) Gives higher application availability by correcting low and high voltage conditions without using the battery. Unattended shutdown This ensures that files are saved and the Operating System is properly shutdown in the event of a sustained power outage. Additional Surge Protected Outlets Surge Only outlets offer protection for non-data sensitive equipment like scanners and printers without reducing the unit's available power or battery capacity. This helps to maximize battery power for equipment that needs it most like a computer and monitor. Automatic Self Test Biweekly testing of all internal components, including the battery, ensures your unit is ready when you need it. Intelligent battery management Maximizes battery performance, life, and reliability through intelligent, precision charging. Audible alarms Proactively notifies you of changing UPS and utility power conditions. Easy Overload Recovery Push-button circuit breaker instead of a standard fuse, eliminates the need to return the unit to the factory for service. Adjustable voltage sensitivity Provides the ability to adapt the UPS for optimal performance in specific power environments or generator applications. Adjustable voltage-transfer points Maximizes useful battery life by widening the input voltage window or tightening the output voltage regulation. LCD graphics display Text and mimic diagrams that display modes of operation, system parameters and alarms. Cold-start You can power on the unit without any input power. This provides temporary emergency battery power when the utility power is out. User replacable batteries Save time and money by swapping the battery yourself. There is no need to send the unit to a factory service center. Hot Swap Batteries You can change the battery without powering down your equipment. This graph is based on actual measured runtime data. All measurements were taken with new, fully charged batteries and a balanced resistive load (PF = 1.0). Actual runtimes may vary from the values of this graph. 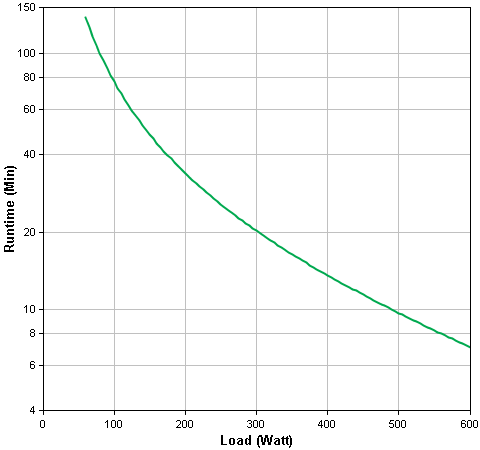 Actual runtimes are dependent on several variables including battery age, battery charge level, environmental conditions and characteristics of the connected load. **The time to recharge to 90% of full battery capacity following a discharge to shutdown using a load rated for 1/2 the full load rating of the UPS. 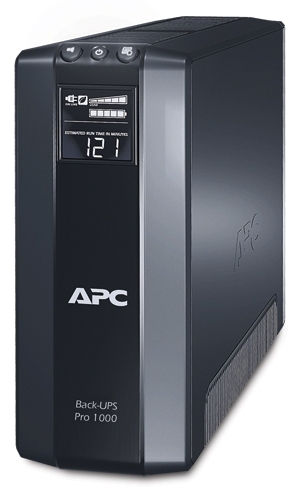 APCGuard.com is a division of Virtual Graffiti Inc, an authorized online reseller.